Martin Scorsese adapts a children’s book (don’t argue, it was published by Scholastic Press) that concerns the real life of film pioneer Georges Melies. The result is a clunky Film 101 course for children that is often visually interesting, but ultimately a conventional bore. The film is set in a sprawling and snow covered 1930s Paris, specifically in a train station that houses the titular young orphan, an elderly Melies’ (Ben Kingsley) steampunk knick knack shop, and your typical assortment of likably quirky characters including the goofy inspector with a heart (Sacha Baron Cohen), the lovely and pure flower girl (Emily Mortimer), and the wise old librarian (Christopher Lee). Hugo maintains the station’s clocks, a skill he inherited from his now deceased father (Jude Law) who also left him with a non-functioning automaton that has surprising ties to the local film pioneer (Hugo’s father’s death strangely has no ties to anything, nor does that of his uncle who took him in). With the help of Melies’ daughter Isabelle (Chloe Grace Moretz), Hugo uncovers the filmmaker’s past, which is conveyed in voice over in a brilliant flashback sequence that reaches the heights of movie making magic that Scorsese obviously recognized in the source material. As expected, everything wraps up nice and tidy in the manner that audiences have come to expect from whimsical family fare. Hugo is a classy film in a fully realized environment that is completely devoid of vulgarities, but its concern with safety is a major drawback as the end result is as conventional as it gets. Watching the complex, CGI-driven shifting gears is a joy as are the vintage film recreations and flourishes that Scorsese employs, but the magic of the clean, antiquated setting with its gold/brown color scheme wears thin rather quickly. The relationship between Hugo and Melies is completely plot-based and hinges on happenstance; there are no metaphors to be found in this script. The necessity of the Hugo character itself is up for debate as it serves no purpose other than to provide a vehicle into the life of Melies, which is far more interesting than the one-dimensional orphan (there’s a reason that all of the critics out there keep harping about film preservation in their Hugo critiques, a lot of them didn’t even seem to take notice of Hugo). 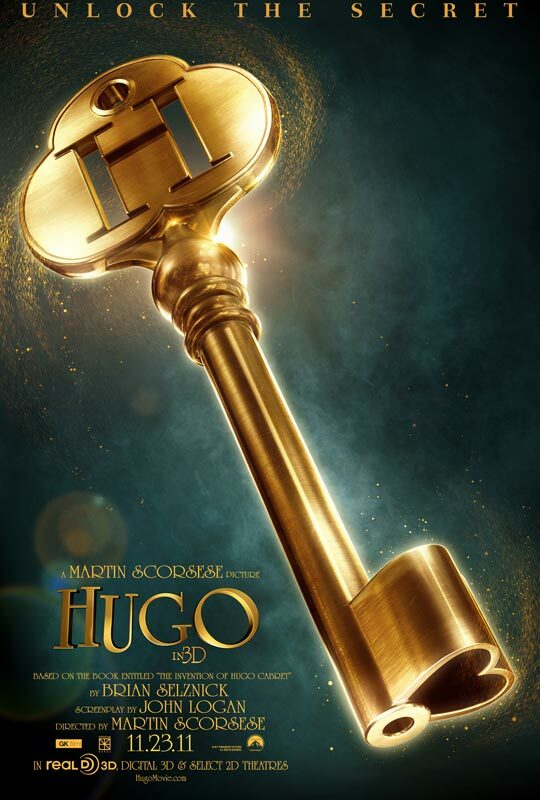 Middlemen aside, Hugo certainly deserves better than what is now Cinedelphia’s vote for Most Boring Movie Poster of 2011. Hugo opens today in Philly-area theaters.